In the last year, Canada’s National Association of Pharmacy Regulatory Authorities (NAPRA) published Model Standards for Pharmacy Compounding of Non-sterile Preparations and the companion Guidance Document for Pharmacy Compounding of Non-sterile Preparations. Navigating through these new requirements and strategizing their practical implementation can be challenging. This program aims to take NAPRA’s standards of practice to the next level by teasing apart ambiguities and providing recommendations and justifications for the adoption of best practices, where applicable. The overarching goal of this program is to provide its audience with clear and concise practical tools that will enable them to achieve compliance with NAPRA’s standards of practice. Through interactive group discussion, participants will establish goals, place tasks on timelines, determine work task allocations, resource requirements, and master task schedules that address competency and compliance requirements. In doing so, participants will be guided through a smooth transition to a new standard of practice, while continuing to manage and oversee current compounding operations. Identify elements of the current regulatory framework for compounding in Canada as it applies to Federal, Provincial/Territorial jurisdictional law, and standards of practice. Describe quality assurance, risk management, and verification program requirements outlined in the Guidance Document for Pharmacy Compounding of Non-sterile Preparations. 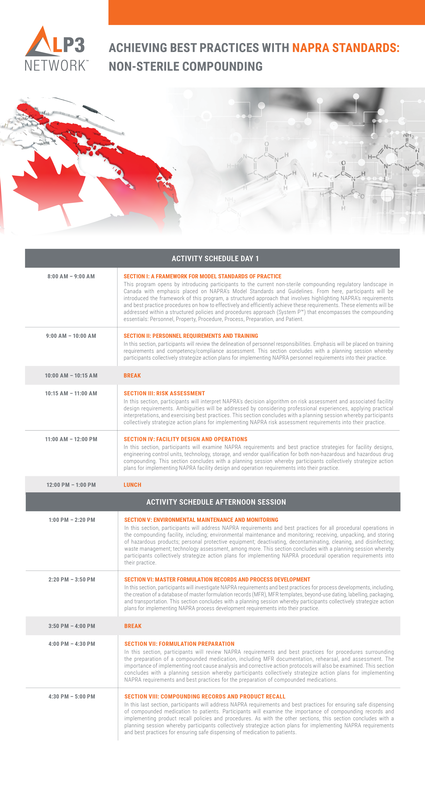 Identify policy and procedure requirements that reflect the current NAPRA model standards. Detail current requirements of master formulation and compounding records. Discuss approaches to ensure personnel safety, and the quality and safety of non-sterile preparations. Apply and adapt standards of practice to best suit your compounding practice. Demonstrate the application and integration of a learned policy and procedure infrastructure into your practice. Differentiate competency assessments from compliance indicators. Integrate a best practice’s approach commensurate with the size, complexity, and risks associated specifically to your compounding practice. Develop a strategic action plan to manage the implementation of the new 2018 NAPRA standards of practice. Mr. Didyk graduated from the University of Manitoba Faculty of Pharmacy in 2002 and immediately went to work as a Pharmacy Services Specialist for the Western Canada division of a national pharmacy provider. Mr. Didyk gained early experience in community pharmacy practice, and in 2005 his career evolved into the ownership and management of community health services. He developed health centres in the Winnipeg area that provided primary and ancillary healthcare services all under one roof. These clinics were pioneers in establishing solid patient outcomes through the use of electronic medical records. His efforts were noted in 2006 when he received the Young Leader in Pharmacy award from the Manitoba Society of Pharmacists. Mr. Didyk has been a facilitator for sterile and non-sterile compounding programs since 2008. His skills and expertise in compounding have made him nationally recognized as an expert in his field. He owns and operates the largest compounding-only facility in Manitoba that delivers specialized patient specific healthcare on a daily basis. In 2015, Mr. Didyk expanded his scope by becoming a surveyor for the Accreditation Commission for Health Care (ACHC). This program is accredited by the Canadian Council on Continuing Education in Pharmacy (CCCEP) for Pharmacists and Pharmacy Technicians. Attend the live activity in full (sign-in and sign-out) and demonstrate satisfactory participation. Submit a completed evaluation form online. Complete a post live event online learner assessment within a two week period; minimum 70% passing grade required. When the aforementioned steps have been completed and approved; participants registered will receive a statement of completion by email.